Introverts at Work – How to Work with Introverts in the Office? Human behaviours are of mixed nature – some are very much vocal, outgoing, sociable and enthusiastic whereas the other section of people loves to take some time to think about a particular issue, generally prefer to stay alone although contributing to several aspects silently. While the formers are known as an extrovert, the later people are being termed as introvert ones. In every sphere, there are introvert and extrovert persons; either at home or at the office or in other places. They are also intellectual human beings and to be precise, equally or even better than several people. So, extracting the best out of those introvert persons is a cutout task and one should give enough emphasis on that. Often the introvert strengths are being termed as their weakness and people normally prefer who speaks a lot. But an introvert person, if taken care of, can provide some stupendous results in any form. How to Deal With Introverts at Work? 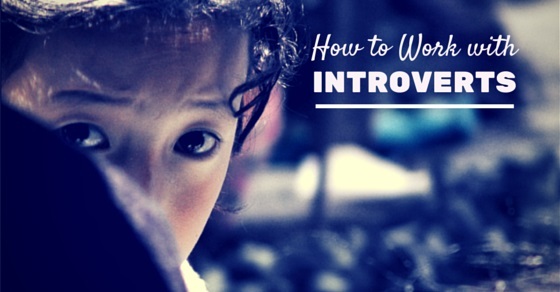 The following mentioned are few introvert tips for working with introverts. It is important to give an adequate time to think, plan and prepare anything. There is a general perception that introverts do need some extra time to prepare anything. But once done, it becomes an unparalleled one. Give them some time, make him a clear understanding of what you want and he will come up with a great solution. People sometimes think that the faster solution is the best ever, but it might not be in every case. A half-baked cake is not as tasty as a full one that takes a bit longer time to get baked. Obviously, there can be emergency situations and one has to show his promptness accordingly. Every person do feel tired after exercising and working, be it a physical one or of the brain. One needs some time to regroup himself and he should be given that luxury. The basic aim remains to be fresh and active when it matters most and that is why introvert people use such gaps to reenergize themselves. There is a requirement of a silent place where an introvert guy can sit and think about his own. That space needs to be created where he can work out of his own. They can’t participate among several people of different types and that’s why some free space can truly extract the best out of them. It is well known that introvert persons love to be alone at certain times and they should be treated in that way. Then only one can expect some creative things from them. Silence is an integral part of any introvert person. It is the basic introvert characteristics and one can hardly come out from this nature. He remains silent either there is nothing to be added to the ongoing discussion or he is trying to come up with some new idea. And for that, he is planning accordingly. This silence should be given its due respect. The introvert people are often misunderstood due to their silence. But others have to understand their basic nature. They can’t take part like an extrovert guy. They love to speak less and speak only when needed. The work environment should be in such a way that there is no need to say anything if not needed. Too much talk for the sake of discussion might not yield good results. It is well known that the introvert people can’t make any sort of self-promotion. But they are equally good in sharing their ideas and opinions. So, one has to stand by such people by giving ample time so that they can deliver the best. Also, while recruiting an employee, the introverted character should not be a negative point in several jobs and one should give due regards to the introvert qualities that they possess. Also, giving some rewards in certain interval boosts these people to perform better and ultimately it is the benefit of the entire organization. Introverts do express their emotions but in a much-closed circle. This is the trademark of those people who love to be alone and share emotions only with some selected people. These emotional introvert love to express their emotions indirectly unlike the extrovert people who used to do the same openly. They should be treated in a very soft way so that they don’t get hurt in any situation. One should give enough importance to the emotional involvement of an introvert guy as they remain best under such condition. Unlike extroverts, introverts are more methodical as well as systematic. So, it becomes much easier for anyone to have such people on the block who can not only deliver quality output, but also will keep every documentation in the proper way. This can be the key tip for the successful introverts. As such people should treat them in a different way so that they can have their own space and accordingly they can perform. If allowed to work on their own, following a proper method the introverts can truly work out wonders. Introvert persons obviously interact with various types of people, but not in a huge manner. The main reason behind this is, they need more time to socialize with other people. So, they prefer a selective set of people with whom he or she can be very much convenient. While dealing with introverts at work, that should also be taken care so that they don’t feel too much alone and bored. They might be a slow starter, but used to share enough among a set of people. It is evident that introvert people talk less, work more. So, the communication should be there to understand what is desired and how the same can be achieved. There should be a system where regular updates can be put and one can share the same. It has been observed that, when interacted with them, more positive and constructive things do come out. As they love to think and that too in depth, the communication system holds a special importance in this entire chapter. There must be a consistent system by which one can periodically give his own input. Introvert persons normally keep most of the things within themselves, but that should be open to public so that one can understand his importance. The sharing of thought can be in any way, it can be a simple discussion or even a detailed approach where one can note each and every outcome. Whatever it is, the focal theme remains to be enlightened by these giants and anything can be done for them. There is no denial of the fact that the introvert persons also do contribute to a great extent. There is no doubt of their quality as well as dedication. But their efforts should be treated in a different manner. The entire thing should be optimized in such a way that he gets enough liberty while working and the management also can get a perfect output. Only then, an introvert person can give his best and that stress-free environment will extract the best out of him. This is the best way to receive optimized contribution from the desk of extreme introvert people. Be it extroverts or introverts, everyone is important. But the introvert people must get some preference in terms of treating as they are more sensitive and emotional compared to the extrovert persons. In fact, they too demand some kind of attention unwillingly. This is important so that they have that cushion in mind while producing any kind of output. With proper importance and preference, they can be an asset to anybody. Introvert people are much better at written communication rather than verbal one. So, it is always better to engage them in writing so that they can express any situation in the perfect way. They can produce a quality output with all the related points and that can be extremely useful for any situation. In the official procedure, it is better to have a report from them in the e-mail format so that they get some time to think and for preparing the same. Introverts always love to interact anything individually. They don’t feel too much comfortable in a gathering and prefer to stay away from such. But the same person opens up when involved in a one to one conversation mode. It is better to allow some time to them so that they can share several things while having an informal discussion. Then only people will get some valuable input, else they used to make a distance from any type of gathering. With one to one interaction, some good notes can be exchanged and it can really be instrumental in any type of development. Introverts usually become sensitive also, so they have to be dealt with utmost care. A non-demanding attitude is the best one to deal with such people and then only the best can be extracted from such people. They always love polite people who approach with a soft voice. A demanding attitude might ruin the relationship as the introvert persons become bored in such situations. The best thing is when introverts start to speak. Those become a treat to hear as they speak less. So, whatever he says is very much important in that context and one should give enough importance on that. The ambiance must be developed in such a way that the introvert at work feels free to share anything and that will be automatically a useful input for many. So, it is not a tough call to deal with such introvert persons. Yes, they used to speak less, normally avoid gatherings and prefer to stay alone, but that is one side of the story. The other side is, they are full of potential with knowledge, intelligence and wisdom. As there is a difference between introvert and extrovert, that is why they have to deal in a special way different from the extrovert persons. Even the introvert persons love to talk, discuss and share several things. But they prefer a stress-free environment where they can feel free to discuss. The same is observed either in a family or in an organisation where both types of people i.e extrovert and introvert are there. Just a different and sensitive approach is required to work with such introvert people.